This episode is one of only two episodes of season 6 still in colour due to the vandalism caused to the BBC archives in the name to “saving space” due to their belief that the other episodes had no repeat or re-sale value, also the original air-date of 21st December 1970 would likely classify this as a “Christmas special” and might also have saved it…. The episode begins with Albert and Harold playing a game of chess with some very odd looking pieces (pepper pots instead of bishops etc…) that would seem quite fitting for a junkyard recycling other people’s rubbish. A knock on the door disturbs them and Harold answers the door to an Australian gentleman asking to speak to Mr Albert Steptoe. 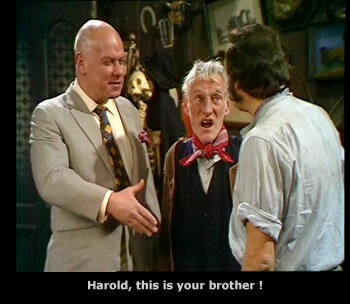 Harold invites him in and he soon claims to be Albert’s illegimate son Arthur. His mother had apparently known Albert before he had met and married Emily and she had left for Australia with him. Albert of course is delighted to welcome his long lost son and half-brother to Harold to the business. 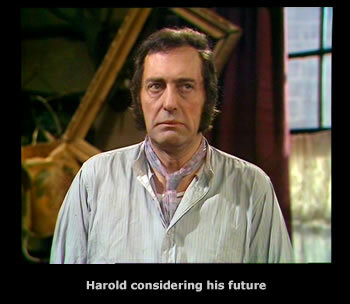 Harold takes great umbrage at this new partner (who also seems lazy and broke) but is warned by Albert that Arthur is his eldest son and heir to the Steptoe “fortune” if he doesn’t play ball. Will Albert be able to get both his sons working together successfully in the firm? And will “Wallaby Jim of the Islands” be a success doing the rounds? This is another of my favourite episodes and one of the first in colour which adds to the realism of the steptoe house of junk. The opening scene sees our two heroes playing chess with a mixed array of chess pieces including salt & pepper pots etc. As always Harold is taking the game against his dad deadly serious. A knock at the door reveals a portly aussie bloke that asks" does Albert steptoe live ere'." Harold replies yes and shows him in. "Well well well, you have'nt changed a bit" say's the aussie bloke to Albert. Albert looking confused replies "who are you?" All is revealed as to the identity of the austrailian. Harold is shocked. Nearly from the first minute of arriving the stranger is borrowing money off our heroes when he has'nt even paid his taxi fair. Does the aussie stranger drive a wedge between Albert and Harold? And does the aussie stranger inadvertingly cause Harold to go on a diet? 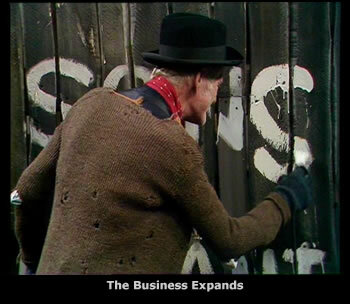 Harold says "we businessmen are digging our own graves with our teeth"
A classic line from this episode is when "little Arthur" says "I 'm dryer than a kangaroo's jockstrap"
The business is growing as Albert's long lost Son turns up. Harold isn't too pleased. Can family unit be restored ? Buy the DVD to find out.